Master’s piece: Raja Ravi Varma’s oil- on-canvas (41.5’’ x 57’’) painting is expected to fetch up to Rs18 crore in the auction. Fugitive jeweller Nirav Modi, a key accused in the $2 billion Punjab National Bank fraud case, was an avid art collector. Now—days after he was spotted in London—a part of his art collection seized by the income tax department will go under the hammer. The Spring Live Auction on March 26 will feature 68 lots, all seized from Modi’s Camelot Enterprises. Modi’s exposure to art started at a very young age, when his mother used to take him for gallery visits. He became a zealous collector in the early 2000s. Soon, he built a collection of more than 400 works, including those of masters like Raja Ravi Varma, V.S. Gaitonde and Akbar Padamsee. 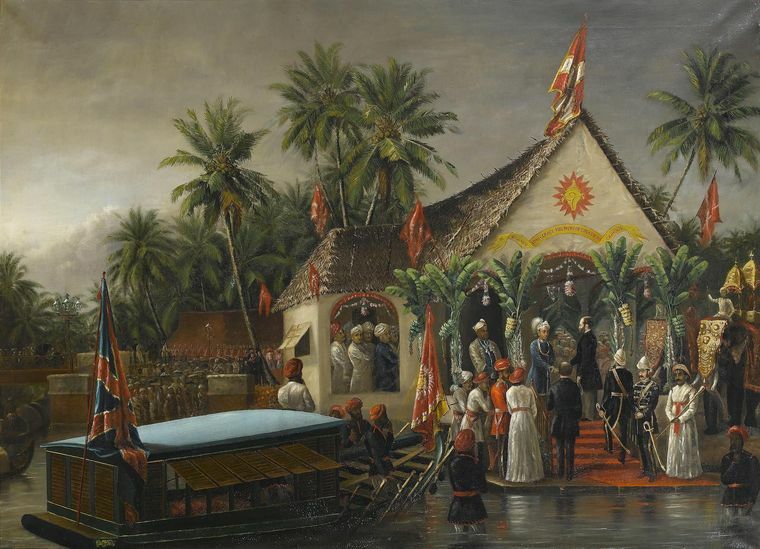 An 1881 painting by Ravi Varma depicting the maharaja of Travancore welcoming British administrators, and a 1973 untitled oil-on-canvas by Gaitonde that explores the idea of metamorphosis, are expected to fetch the highest bids. In addition to Indian works, the auction will feature a selection of Chinese contemporary paintings, too. Modi got introduced to the Chinese ink-on-paper style of painting during his Beijing Olympics trip in 2008. End of the World by Xu Lei, a work he bought then, is part of the auction. Some might wonder whether the fact that a tainted businessman owned the paintings would affect the sale. But, Vazirani is optimistic about the auction. “It includes works by some of the most sought-after names in art world,” he says. The auction is expected to raise anything between Rs30 crore and Rs50 crore.